Now almost a week and a half ago, my break is quickly becoming a receding memory. Still, the pictures provide great entertainment and take me away to some of the most beautiful scenery Colorado has to offer. After Thursday's trip to chase big browns, I had some exploring planned. It would be off to check out the South Platte with a couple of different goals. 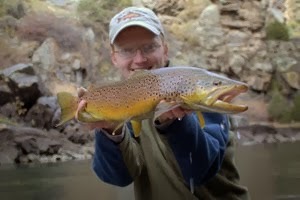 First and foremost, this was a scouting trip, and my goal was to check out the Dream Stream for big lake-run browns. Second, I wanted to see some new to me scenery as well as figure out how long I could count on the trip to the Dream Stream taking me. In the end, the scenery won out over the fishing. I shot several pictures over the course of the day and was quite impressed with the beauty of the area. The scouting was, well, scouting. Lots and lots of walking and looking and walking some more. 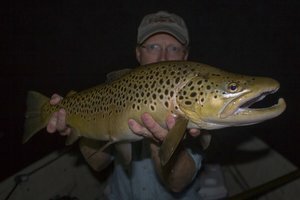 The crowds were huge but fish really weren't being caught except for one very nice brown I saw landed that looked to be in the 22-24 inch range. In fact, I spent far more time looking than fishing and was glad to finally call it quits. Only rarely am I glad to stop fishing but much more challenging than a lack of large fish was the brutal wind. It was howling (literally) out of the west to the point where I was exhausted just from walking through the wind. Still, it had been a good day and if I stopped completely at this point I would have been happy. Instead, I went searching for redemption. I just wanted to catch a fish, any fish. Eleven Mile Canyon contains some beautiful water, and I remembered doing well there during my previous visit to the area. On the way, I found some aspen at what I would consider to be peak colors. Finishing my descent into the canyon, I started upriver and soon came to a big pool I remembered quite well. Fish were lined up sipping something small off the surface. The wind was much better in the shelter of the canyon walls. Parking the car and changing my rig for small dry flies, I was soon casting. However, the five weight line slapping the gentle autumn flows was too much for the trout and I watched as one by one, they disappeared to wherever fish hide when some crazy fisherman is flogging the water. 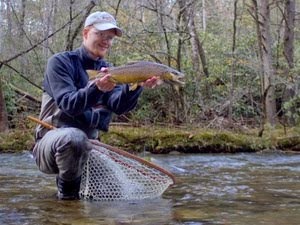 Changing to 6x and smaller flies, I continued looking for feeding trout. In the pocket water, lots of fish were feeding. and I suspected that I might have better luck in the faster flows. Nice fish kept spooking, reminding me that I was definitely NOT on top of my game. Finally, starting back down towards the car, I was ready to call it a day. Then I saw one more fish. Three casts later, I saw it move towards where I suspected my fly was. It turned abruptly so I set the hook. Finally, a trout. 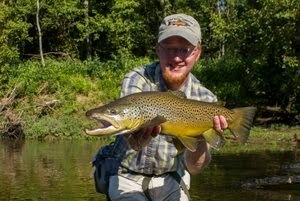 Even better, it turned out to be a brown trout! 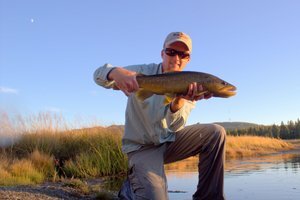 On most days I would be unhappy to catch just one fish, but on this day of minimal fishing and lots of scouting, I was glad to finally hook one. Well, considering the circumstances I think that 1 trout was a pretty good job this day. David, thanks for sharing your exploration down in South Platte country. Beautiful time of the year to be out even if the fishing plays second fiddle. Sometime, will have to get down that way and see for myself.